So I successfully replaced a few two dollar switches to control valves with a much more expensive setup using LabView. If you didn't know, LabView offered their 2014 version for home use for $50, called LabView Home. You dont get engineering support but there is a forum which answers a lot of questions. The new VAT pendulum valve pretty much necessitated the need to switch over to a PC to control it since it needs serial commands to tell it what to do. So while I was at it I got rid of the thermocouple gauges and replaced them with some Mini Convectrons and used a USB unit with analog inputs to handle that and did all the math inside LabView to convert that signal to something useful. I also installed a VFD for the roots blower so I can run it at a slow speed while pumping down and then kick in to high speed once the chamber gets below 35 torr. There was a driver for my ion gauge too so that gets displayed on the main screen as well. All of the digital IO is handled by an ADLINK PCI relay card. LabView makes it real easy to make strip chart type graphs so I made up pressure/time graphs for both the ion gauge as well as the convectrons. All of this is running on an old rack mound industrial PC with a P4 motherboard card. LabView has a pretty steepish learning curve but it is real nice when you need to add or modify something, it's mostly graphical so it is a matter of dragging different modules around and "wiring" them together. For example, to add the two speed sequence for the blower I just copied an existing output routine, changed the output port, and created some new variables and modify the state machine that controls the sequences for the system. That took about 5 mins. Then added one more wire from the IO breakout to the VFD and set a parameter and I was done. 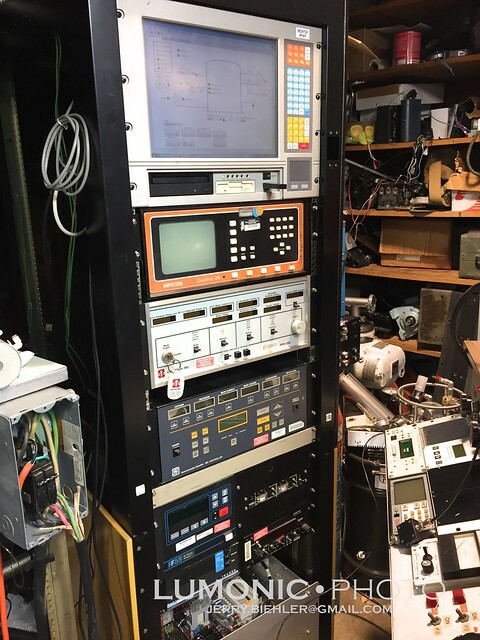 The whole rack, the ion gun power supplies, RF power supply and match controller for one of the ion guns, ion gauge, and mass flow controller. Very impressive control interface. 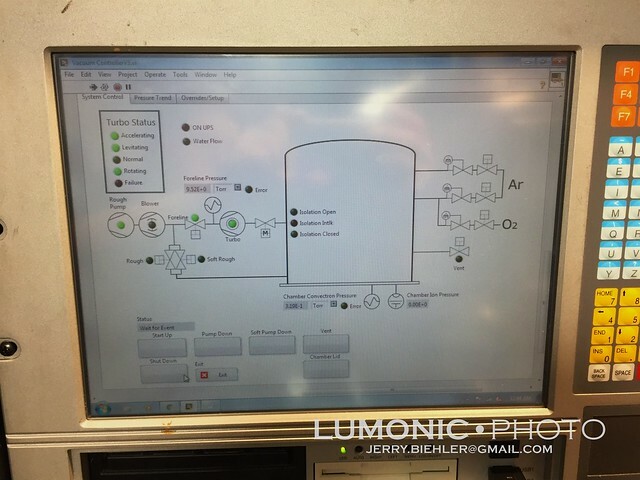 Are the vacuum controls icons on your screen available in LabView, or did you create these yourself? If the former, where do you find them in LabView? Impressive set up, Jerry. I have a couple basic questions on your vacuum system after looking at your control screen. What's the difference between the valve selections for Rough and Soft Rough, and how do you use them in the operation? In Turbo Status, one is Levitating. Is that something related to magnetic bearings and is it a status signal provided from the turbo? The turbo is an Osaka 2000l/s maglev turbo. The interface has a bunch of relay outputs, one for each of those indicators. I monitor the levitating signal so that when I shut down the system the roughing pump and blower will automatically shut down after the rotor has landed. Also the Turbo and computer are on a UPS, if the power dies the UPS signals LabView to start shutting things down. Currently the plan is it shuts down the turbo and closes the isolation valve and then shuts down the bower and rough pump. There is about 12' of KF40 metal bellows on the foreline which acts as a vacuum reservoir and should keep the foreline under the 2 torr max. Once the turbo has stopped the foreline valve closes. Ill take a pic of the turbo and isolation valve tomorrow. A real killer, plus-ultra vacuum system, for sure! As close to a professional-scientific system as one might attempt in a personal setting. This is the setup of a true "vacuum head", (A moniker as proudly worn by a vacuum enthusiast as that of "fusioneer" in these forums.). With such a system, almost any vacuum related project is within grasp. I do miss Steve Hansen's, magazine, "The Bell Jar" publication of the 90's. What is left of it is still on line and informative. Jerry's system and folks like Jerry were the lucky audience that publication was aimed at assisting, just as we are aimed at helping folks do fusion. I just visited Steve's site and it appears his forums are in maintenance mode. I recommend his site and its information to any would-be vacuum head here. I have constantly left his URL to those here that might be interested in a deeper amateur dive into vacuum related topics. The archives are worth the time to go through. Our vacuum forum is now vast and helpful with over 17 years online. However, it is aimed more at a technical final vacuum result, (single micron level), while the bell jar was aimed at true scientific vacuum levels of 10e-6 torr or better. P.S. I just put up a FAQ for the Bell Jar website with info on his site and a URL to his Refrigeration pumps and Steve's analysis of them. I used to use The Bell Jar but they were basically dead when I used it. Sadly this is about one of the only places where vacuum is used. My systems are pretty insane, really. The big one is a 26" diameter x 30" tall jar with the 2000l/s turbo. 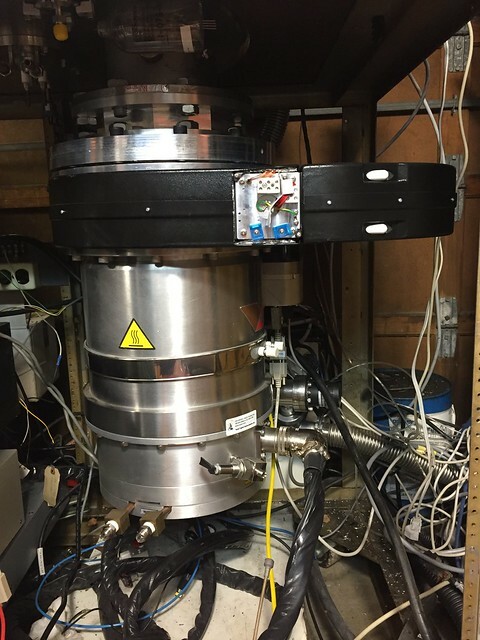 I am setting it up for ion assisted e-beam deposition and sputtering. It originally came out of tektronix and has been traded and handed down for quite a while. This is the turbo and vat valve I installed on it. I had to make all the adapters and modify the valve to fit. The turbo is a ISO-K 200mm and the valve is JIS 200, the only difference is the bolt pattern. The valve I found at a scrap yard, it only has like 2000 open/close cycles on it. Seems to work fine. 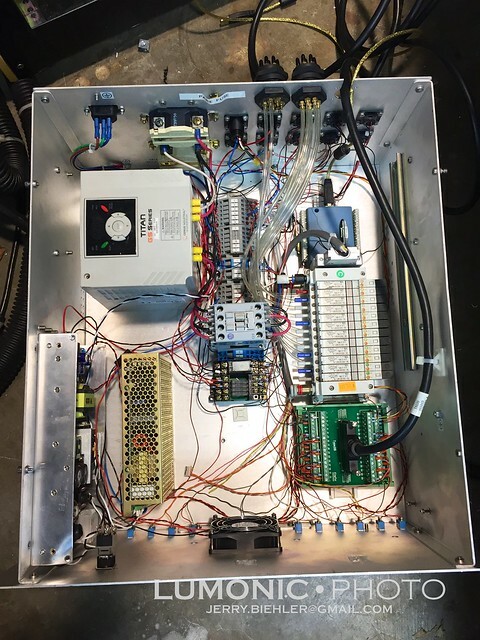 It has a built in controller that connects to one or two baratrons and handles closed loop pressure control. Also has built in heating for baking out, you can see the connections for the heater and RTD on the front of the valve. I actually ended up buying an old military generator to run the e-beam power supply for this chamber, 10kw 3 phase is more than my house service! The other system is a smaller system also came out of tektronix and then SITe, who took over the scientific CCD cameras that Tek made. It's a mix of Cha and Veeco systems. It has a water cooled 18x30 bell jar and is set up for thermal evaporation. 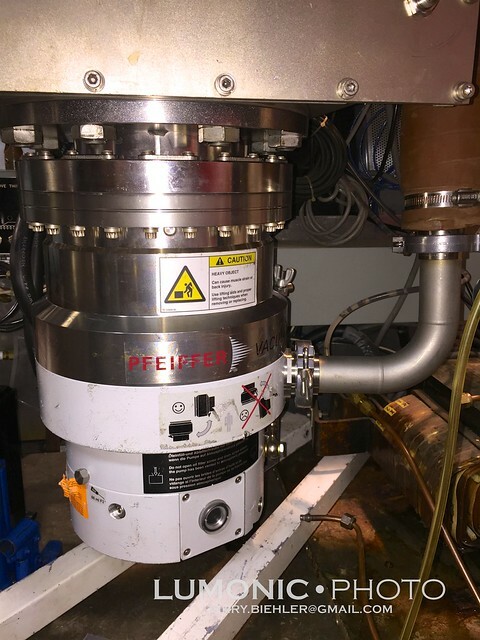 I am adding a small Commonwealth Scientific ion beam gun for ion assist and just finished replacing the old diff pump with a Pfeiffer 1000l/s turbo. I had to make and adapter to adapt the 10" CF to the 6" ASA. This one is all manually operated with hand valves for roughing. Really nice looking setups. I’ve read roots blower are helpful in speeding the pump down times in that critical region at the low end of the roughing pump and high end of the turbo. I’m curious if the pump down time is the primary reason for the additional pump, or are the gas loads in your applications such that you require higher throughput in the foreline? Maybe there is some entirely different reason for this type of setup? Thanks for sharing. It makes a big difference when you can kick it on, this blower does not have a bypass on it like the WAU version (this is the Stokes WA151) so I cant kick it on till it reaches a certain pressure otherwise there is too much pressure differential on the inlet and outlet. Also roots blowers are effectively a dry pump and they isolate back streaming to the roughing pump and keep oil out of the system. I used and wrote a lot of code using Lab View some years ago (so am a bit dated.) I did find it useful but the interface boards are not cheap. Also, while it wasn't too difficult to integrate an A/D board with LabView the learning curve is steep. Can't think of many practical advantages for that program for a home user unless they intend to use it to enhance their resume. I remember that the software has some good signal processing algorithms but most detector systems are rather low tech compared to what that program is more generally used.